See in Glossary this is done using SetTexture command. See in Glossary. It is advisable to use programmable shaders these days instead of SetTexture commands. Fixed function texturing is the place to do old-style combiner effects. You can have multiple SetTexture commands inside a pass - all textures are applied in sequence, like layers in a painting program. SetTexture commands must be placed at the end of a Pass. Assigns a texture. TextureName must be defined as a texture property. How to apply the texture is defined inside the TextureBlock. The texture block controls how the texture is applied. Inside the texture block can be up to two commands: combine and constantColor. combine src1 * src2: Multiplies src1 and src2 together. The result will be darker than either input. combine src1 + src2: Adds src1 and src2 together. The result will be lighter than either input. combine src1 - src2: Subtracts src2 from src1. See in Glossary is opposite direction: src1 is used when alpha is one, and src3 is used when alpha is zero. combine src1 * src2 + src3: Multiplies src1 with the alpha component of src2, then adds src3. All the src properties can be either one of previous, constant, primary or texture. Previous is the the result of the previous SetTexture. Primary is the color from the lighting calculation or the vertex color if it is bound. Texture is the color of the texture specified by TextureName in the SetTexture (see above). Constant is the color specified in ConstantColor. The formulas specified above can optionally be followed by the keywords Double or Quad to make the resulting color 2x or 4x as bright. All the src properties, except lerp argument, can optionally be preceded by one - to make the resulting color negated. All the src properties can be followed by alpha to take only the alpha channel. ConstantColor color: Defines a constant color that can be used in the combine command. Unity versions before 5.0 did support texture coordinate transformations with a matrix command inside a texture block. If you need this functionality now, consider rewriting your shader as a programmable shader instead, and do the UV transformation in the vertex shader. Similarly, 5.0 removed signed add (a+-b), multiply signed add (a*b+-c), multiply subtract (a*b-c) and dot product (dot3, dot3rgba) texture combine modes. If you need them, do the math in the pixel shader instead. Before fragment programs existed, older graphics cards used a layered approach to textures. The textures are applied one after each other, modifying the color that will be written to the screen. For each texture, the texture is typically combined with the result of the previous operation. These days it is advisable to use actual fragment programs. Note that each texture stage may or might not be clamped to 0..1 range, depending on the platform. This might affect SetTexture stages that can produce values higher than 1.0. Here, we multiply the RGB colors and add the alpha. By default the primary color is the sum of the diffuse, ambient and specular colors (as defined in the Lighting calculation). If you specify SeparateSpecular On in the pass options, the specular color will be added in after the combiner calculation, rather than before. This is the default behavior of the built-in VertexLit shader. See in Glossary for the cards they want to support. 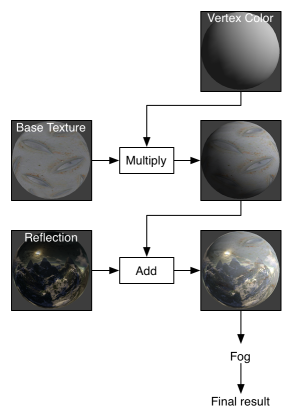 This shader uses the alpha component of the _MainTex to decide where to apply lighting. It does this by applying the texture to two stages; In the first stage, the alpha value of the texture is used to blend between the vertex color and solid white. In the second stage, the RGB values of the texture are multiplied in. We can do something else for free here, though; instead of blending to solid white, we can add a self-illumination color and blend to that. Note the use of ConstantColor to get a _SolidColor from the properties into the texture blending.